One of my regular and favourite winter climbs. Col de Pierre Carrée (1844 metres) is the highest paved road open 12 months a year in Haute Savoie (I think) – giving access to Flaine Ski Station. Currently it is very warm, no need for too many layers. At 21 kilometres, and roughly 1,350 metres ascent, this is a big climb, but not ridiculously steep. It’s roughly 1% less steep on average than more famous giants that are of a similar length (eg. Tourmalet, Ventoux, Glandon, Madeleine, etc). See profile above. 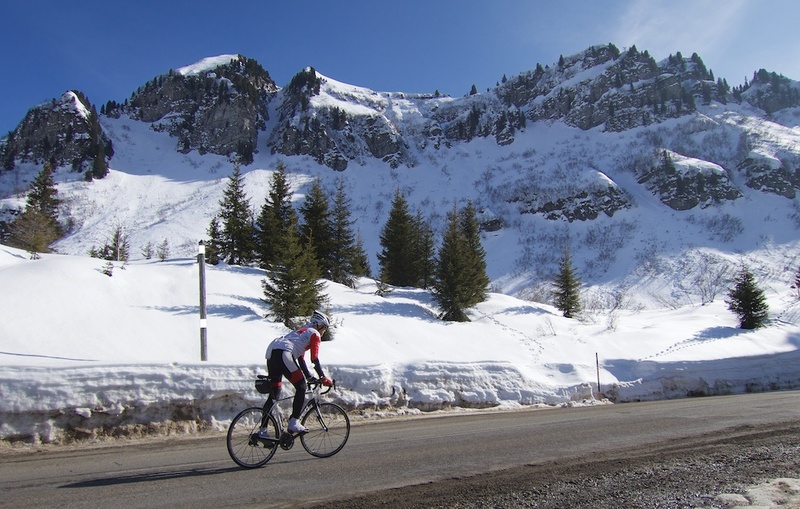 After Les Carroz, half way up, it’s a very quiet road. Some long straight stretches, but plenty of scenic hairpins as well. And when the ski season is over, it is near deserted as Flaine shuts down – even in summer. 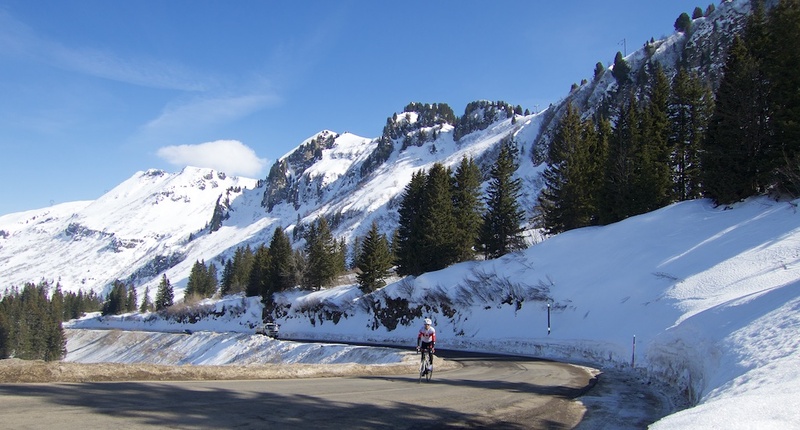 At the summit, is Flaine Golf Course – with Cross Country Ski Trails in winter – see here. I worked quite hard trying to beat my best time to the top – missed by 2 minutes, damn head-wind 😉 . I then just took my time descending while taking some photos. But, as the profile above shows, you can go over the top and head down to Flaine (a dead-end) for a scenic little climb back. In summer, you can go much higher on a mountain bike. Here and here are a couple of very challenging, but super fun routes. Wanted to let you & your readers know that I attempted this Col today but was turned back by workmen, it appears that the road is closed until June 30th. 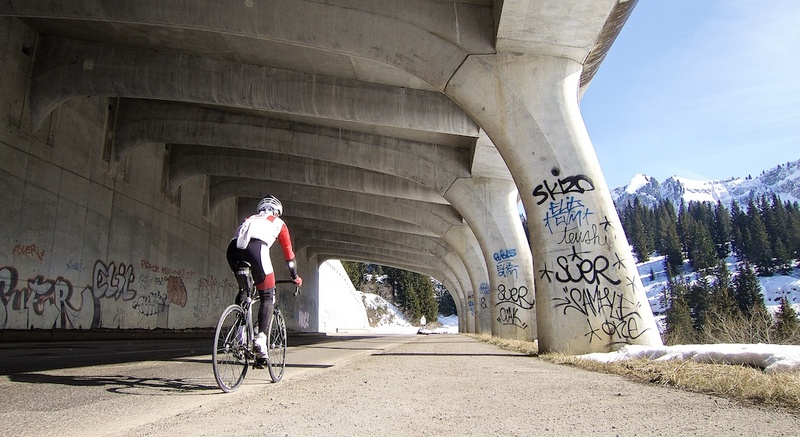 thx for the heads up..
Agree it’s a great ride as not too difficult with great views over the ‘Route Blanche’. TdF did the lower half in 2009 (cote d’Areches). Had a great lunch in Les carroz on the way down. Re Steve’s comment went up the Joux Plan past ‘route baree’ signs but workmen allowed us to walk on a 0.5m wide strip of grass alongside a new section of freshly laid, steaming tarmac with our bikes on the opposite shoulder so if we stumbled they wouldn’t get stuck in the new tar! Yes, the tour did perhaps the first 6 kilometres of the 21kms. Agree on the difficulty comment. It’s a similar length to some of the French giants like Ventoux, Tourmalet, Madeleine, Glandon, but maybe 1% or less steep on average, so a good confidence builder in preparation. 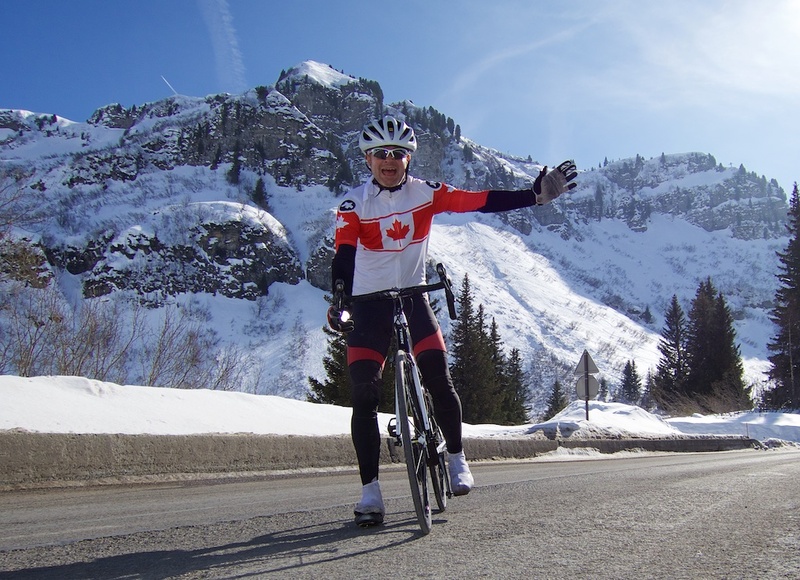 A few years ago you were kind enough to suggest some climbs for one of my first trips out to the Alps. I’ve been out just about every year since and am thinking about an attempt at ‘everesting’ this July. 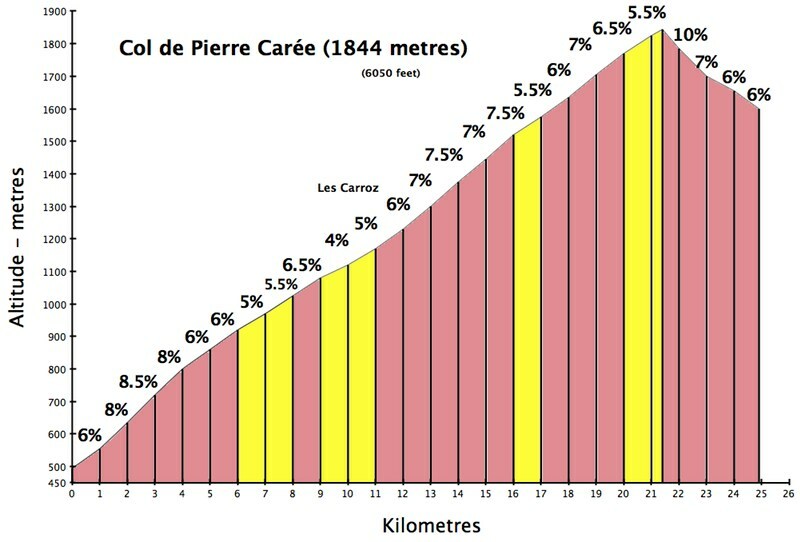 It feels like Les Carroz to the top of Pierre Carree would be a good bet for the climb: a sensible gradient and a decent length (under 12 and a half reps required) and not much traffic (which seems like a good reason for not going all the way down to the valley). It would be handy if the restaurant at Molliets is open but I could leave a car in the ski lift car park as a base – and there’s always Le Marlow in Carroz itself. I rode it last summer and it feels perfect but I wondered if you know anything that I don’t that might change my mind? I’d be very grateful for your thoughts. Thank you, as ever, Will. A big day indeed (and, I fear, a decent part of the night)! I saw your 2017 kick-off note – it would be terrible if you didn’t keep the blog going, it is a constant inspiration.